Just as you would have yearly service performed on your air conditioning system, regular inspection & maintenance of your heat pump will ensure highest operating efficiencies while also protecting your investment… Potentially extending the useful life of your heat pump far beyond the warranty period. Our expertly trained factory service technicians offer comprehensive maintenance procedures that will insure your heat pump operates efficiently and reliably when you need it to. We recommend all heat pump owners take advantage of this annual service, starting one year after the installation of the unit. You will be surprised at the minimal cost of this service… The service is very reasonably priced for what is included. 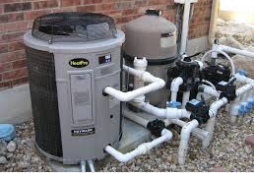 The pool heat pump is installed right into your existing pool-plumbing configuration, after the filter and before a chlorine generator, if you have one.